Condições de tratamento de dados pessoais de acordo com o novo Regulamento (EU) 2016/679 do Parlamento Europeu e do Conselho de 27 de abril de 2016 – Regulamento Geral sobre a Proteção de Dados (RGPD), em vigor desde 25 de maio de 2018. Os dados recolhidos, que serão objeto de tratamento informatizado, destinam-se a dar cumprimento aos direitos e deveres decorrentes da qualidade de sócio(a) da Associação Portuguesa de Controlo Automático (APCA). Ao seu titular, é garantido o direito ao acesso, retificação, alteração ou eliminação, sempre que para isso se dirija por escrito à APCA. Best Master Thesis: Regulation of the APCA Master of Science Thesis Award It is awarded biennially by APCA, the Automatic Control Portuguese Association, the APCA Master of Science Thesis Award to the best MSc Thesis in Automatic Control and related scientific areas, to stimulate innovation and rigor of the research work, as well as promoting dissemination of relevant scientific achievements. The award is governed by the following rules: 1. Submission of Applications: 1.1. The deadline for submission of applications is 20 February 2018. 1.2. 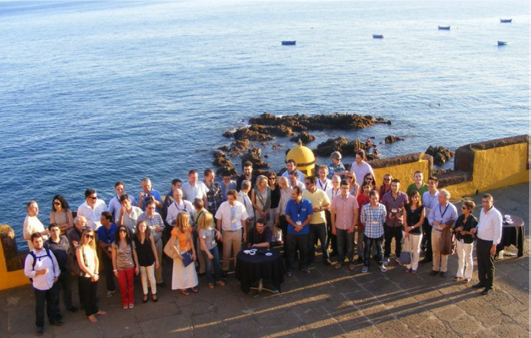 Original MSc Thesis eligible for the prize should be sustained during the years 2016 and 2017, by students, independently of their nationality, who have developed their research in portuguese institutions. 1.3. The documents referred in paragraph 2 shall be sent by email to secapca@gmail.com with the subject "Application for APCA Master of Science Thesis Award". 2. The application for the Prize consists of the following documents (pdf files): 2.1. Synthesis of the work, up to a maximum of 6 pages A4, 12pt, 1.5 line spacing, including the title of the dissertation and the author’s name and affiliation, and 2.1.1. A copy of the MSc thesis; 2.1.2. Curriculum Vitae of the author 2.1.3. Certificate of MSc completion. 3. The jury will be appointed by the APCA governing board and shall consist of doctoral members of recognized scientific prestige in Automatic Control. Members of the APCA governing board and supervisors of submitted thesis will not be members of the jury. 3.1. The general criteria for examination of thesis are as follows: 3.1.1. Work theme adequacy of the scope of the Award 3.1.2. Technical and Scientific quality 3.1.3. Scientific innovation 3.2. Jury decisions are final, of which there will be no appeal. 3.3. The jury may not award the Prize or decide to share the award among several competing thesis. 4. The award of the Prize will be announced on the APCA website and at the CONTROL 2018 Conference, delivered in the form of a diploma and widely disseminated through APCA communication channels. Requests for further information or clarification should be requested to: APCA - Portuguese Association of Automatic Control , Email: secapca@gmail.com. Best PhD Thesis: Regulation of the APCA Doctoral Thesis Award It is awarded biennially by APCA, the Automatic Control Portuguese Association, the APCA Doctoral Thesis Award to the best PhD thesis in Automatic Control and related scientific areas, to stimulate innovation and rigor of the research work, as well as promoting dissemination of relevant scientific achievements. The award is governed by the following rules: 1. Submission of Applications: 1.1. The deadline for submission of applications is 20 February 2018. 1.2. Original PhD thesis eligible for the prize should be sustained during the years 2016 and 2017, by students, independently of their nationality, who have developed their research in portuguese institutions. 1.3. The documents referred in paragraph 2 shall be sent by email to secapca@gmail.com with the subject "Application for APCA Doctoral Thesis Award". 2. The application for the Prize consists of the following documents (pdf files): 2.1. Synthesis of the work, up to a maximum of 6 pages A4, 12pt, 1.5 line spacing, including the title of the dissertation and the author’s name and affiliation, and 2.1.1. A copy of the doctoral thesis; 2.1.2. Curriculum Vitae of the author 2.1.3. Certificate of PhD completion. 3. The jury will be appointed by the APCA governing board and shall consist of doctoral members of recognized scientific prestige in Automatic Control. Members of the APCA governing board and supervisors of submitted thesis will not be members of the jury. 3.1. The general criteria for examination of thesis are as follows: 3.1.1. Work theme adequacy of the scope of the Award 3.1.2. Technical and Scientific quality 3.1.3. Scientific innovation 3.2. Jury decisions are final, of which there will be no appeal. 3.3. The jury may not award the Prize or decide to share the award among several competing thesis. 4. The award of the Prize will be announced on the APCA website and at the CONTROL 2018 Conference, delivered in the form of a diploma and widely disseminated through APCA communication channels. Requests for further information or clarification should be requested to: APCA - Portuguese Association of Automatic Control , Email: secapca@gmail.com. Boletim Eletrónico: É com muito prazer que anunciamos o lançamento do boletim eletrónico da APCA. Lançada a edição de Janeiro do boletim eletrónico da APCA.